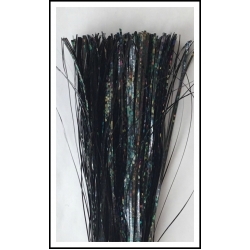 Black LL2 303 is one of our popular custom tinsel blends for muskie, walleye, and northern pike fishing. It comes in a variety of sizes; 8 inch skirt tied on coil, 9 inch skirt on skirt body, 32 inch hank, or 64 inch hank. It is 1/32 inch holographic black.